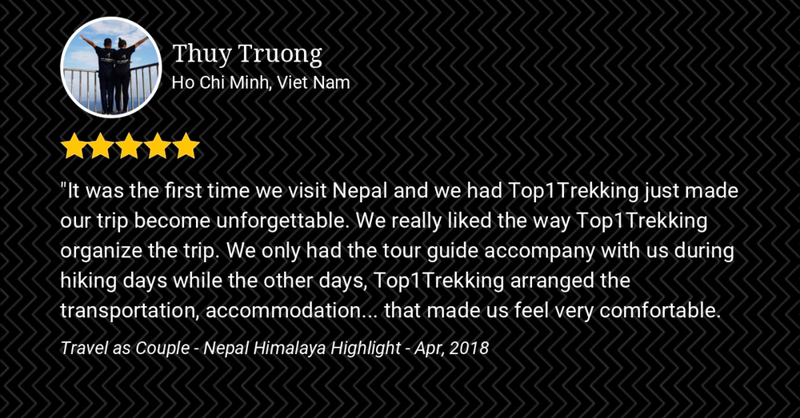 Why book a with Top1Trekking? - Just a few of the scenic sights you’ll see during your trip. On arrival at Tribhuvan International Airport, you will be greeted by a driver who will transfer you to your hotel in Thamel, tourist center of Kathmandu. After settling in, the rest of the day is free for you to explore this corner of the city with abundance of shopping streets sell many things from trekking equipments to souvenirs. Spend the night at Hotel. For those arriving early today you have the option to explore Asan Bazaar market, a local market and historical location nearby Thamel, another recommended sight to see is Kathmandu’s Durbar Square which in walking distance from Asan Bazaar. Average Driving Distance: 6.5 km / 4 mi. Enjoy an early breakfast at the hotel before being picked up by your guide for a day out exploring the Kathmandu Valley visiting some of UNSECO World Heritage Sites. Visit the historic city of Bhaktapur Durbar Square. Make a kora around Bouddhanath stupa. Witness the cremation of Hindus along the holy river of Bagmati inside Pashupatinath temple. These are experiences for you to have a great overview of Kathmandu, a melting pot between Hinduism and Buddhism. At late afternoon, get introduced to trek leader and discuss our trip at Top1Trekking’s office. Average Driving Distance: 39 km / 24 mi. Start the day bright and early as you have full day of driving to trail head at Koto. Drive first to Besisahar on black-topped roads and arrive in time for lunch. Enjoy lunch then change to a Jeep for the rugged journey to Koto. The dusty road travels along the old Annapurna Circuit trek route but we will be rewarded with scenic view of amazing gorges and waterfalls. Spend the night at the mountain lodge in Koto. Average Driving Distance: 236 km / 147 mi. Start today’s walk early as it will be long, the trail begins at the town’s exit ‘kani’ entering forests then following the riverside with some section of the trail is cut out of rock cliff. The trail mostly goes through dense pine forests in the shade of deep gorge like a fairy tales. Crossing a suspension bridge, continue to the east side of Nar Khola until reaching Chhongche Cave where we stop for lunch. Dharamsala still stay inside the shade of the deep gorge and not the nice spots to overnight. We continue through forest then start the final ascent to Meta (3620m) where the view is opened up with Lamjung Himal, Koto Peak and Annapurna II come into sight. Spend the night at mountain lodge in Meta. Much of today’s energy spent on ascending and descending several mountain ridges and crossing stream. From Meta, set out on the trail on the right side of the Phu Khola, you will hear less river sound as the trail is high above. Look to the left side, there is a monastery where you will stay on the way back, soon the trail come to the junction which leads to there. Steadily climb on your own pace you will reach a chortens and abandoned Khampa settlement of Jhunum (3707m) had gone to ruin. Continue descend into the river and climb up for one more hour to Chyaku (3,800m), another former Khampa settlement where you stop for lunch. Now your energy has been recharged, continue climb up and down, cross two more suspension bridges you make the final ascent to top of mountain ridges where there is great view of meadow of Kyang (3887m), another former Khampa settlement used by people from Phu village in the winter. Trail towards Phu goes through narrow gorge with some part of trail is carved on cliff wall. Grab your chances of spotting blue sheep grazing on hillsides. Pass several Buddhist chortens, continue along the river to a huge rock spire form a ‘mountain gate’ to Phu region, going up to the real gate of Phu is another 20 min climb. Trail pass ruined dzong (Tibetan-style fortress) accessible by a scary bridge, cross a big mani wall painted in blue. You will see a long suspension bridge cross to other side where village of Phu (4070m) is located on the high eroded cliff. Devote sometime to explore Phu village, there are more houses and barley fields higher up. You might see people do local farming or herding their yak. On a hill top just next to Phu village, there is Tashi Lhakhang Gompa (4150m) and a line of thirteen colorful chortens. Retrun the same way on the way up pass Kyang then Chyaku where you will stop for lunch. Chyaku is a nice Khampa settlement built on small hill with great view to several mountain gorge both to the north and to the south, the river is right down below. Trail continues to Jhunum then turn off to the right branches lead to Nar, enters forest then drops down on sandy trail which cross over a scary bridge, you might not want to look down on deep gorge. Make the final ascent to Nar Phedi (3,490m). The steep climb to Nar will start right away for almost two hours till you reach the first gate of Nar. After the gate, trail continue ascent on flatter part with fantastic views of Pisang Peak, climb again and passes a wall and gate that protecting the meadow of Nar preventing Yak to go to down to lower area. Shortly after the wall, you will see a row of several chortens and big stupa (4140m), turn back to see the snowy peak of Kanguru Himal. Turn around the corner for 30 mins till the village of Nar (4180m) and its barley fields. Nar is larger and lively than Phu. Explore the villages where you will see goats running down on the narrow street, out in the fields. Start the day early in the morning from 5:00AM we leave Nar then take the gentle climb through the valley, Pisang Peak is on our left side. 3 hours from Nar we will reach Kang La Phedi (4620m). Cross the river to the right side then climb up steep trail till a small lake with fine views of Himlung, Kanguru, Manaslu. Make the final ascent on zigzags trail to the top of Kang La 5320m. You will be welcome with incredible views over Annapurna II, Gangapurna and Tilicho Peak. Enjoy your last day walking in the mountain on the trail from Ngawal to Pisang where we sill stop for lunch. Take a jeep drive to Besisahar where the first comfort hot shower is waiting for you. Average Driving Distance: 79 km/ 49 mi. Drive back to the city of Kathmandu takes 6 hours, explore the shopping center of Thamel to grap some souvenirs. Average Driving Distance: 172 km / 107 mi. When it’s time for your adventure to end, you will be picked up from your hotel by our staff about three hours before your flight. If you are interested in extending your stay, we can book extra nights and activities in the Kathmandu area or even combine this tour with a visit to one of our other destinations in Nepal. - Don’t worry, we’ve got this covered. - Just a little bit of information until you’re in Nepal to take your own pictures. The accommodations for this tour include comfortable three-star (or similar quality) hotels in Kathmandu or comfort hotel in Besisahar. The rooms all have private WC and hot shower. All provide breakfast (included in the price). On the trek, mountain lodges in Nar Phu region have basic facility (Twin bed room and blanket) with share bathroom. Food from menu ranging from Nepal Dah Bhat to international but rather simple. In Nar Phedi, we will stay in local monastery with all meal will be prepared by monks. Due to the region sit in Himalayan rain shadow, this trek is doable from Mar to Nov. In the Winter (Dec to Feb) the people form Nar and Phu villages move down to lower altitude so mountain lodges may not be opened and the Kang La is usually closed. Best time of the year to do Nar Phu Valley trek is September and October with high success rate of crossing the Kang La Pass. Another good time to visit the region but if you need few backup days to make sure you have enough time to cross the pass. There is risk of avalanche during spring time. If you have few more days, a side trip to Tilicho Lake is highly recommended. From Ngawal, change the route to Manang then continue to the great ice lake. After the lake, you can either continue the trek to Muktinath (require one night camping) or back to Manang. Another option is to join the Annapurna Circuit route from Ngawal toward Muktinath via Thorung La pass. Due to the region locate in far remote corner, the distance between one tea house and another is quite long making this one of the most challenging treks in the region. The crossing the Kang La (5320m) is not technically difficult but the day will be long with almost 11 hours ascent/descent from Nar. This trek would best suit those who have experiences trekking in the mountains. Permit costs $90 USD per week per person from September to November. From December to August, it’s $75 USD. Top1Trekking charges a non-refundable $100 deposit at the time of booking. The remaining amount you will pay on arrival. After booking your tour with Top1Trekking, you will be contacted within two working days by one of our travel consultants, who will be your main contact point for all of your travel information before, during and even after your trip. Your travel consultant will provide you with details about your booking and your remaining payment (if not paid in full). You will also receive more information about what to expect during your holiday. • The average temperatures in mountains can have heavy shift from of minus -10° – 25° Celsius. We recommend bringing warm, waterproof outerwear, thermal layers and good hiking boots and/or rubber boots. Warm sleeping bag can help better sleep on mountain lodges. Explore more detail on packing if you need. • The itinerary can change without notice due to weather conditions. In the rare event that an activity is cancelled, you will be refunded for that activity. • The currency in Nepal is Nepalese Ruppe (NPR) that you can exchange in Thamel area. We recommend bringing some USD currency or a debit card (bank card) with a 4-digit PIN number for cash withdrawals at ATM machines.